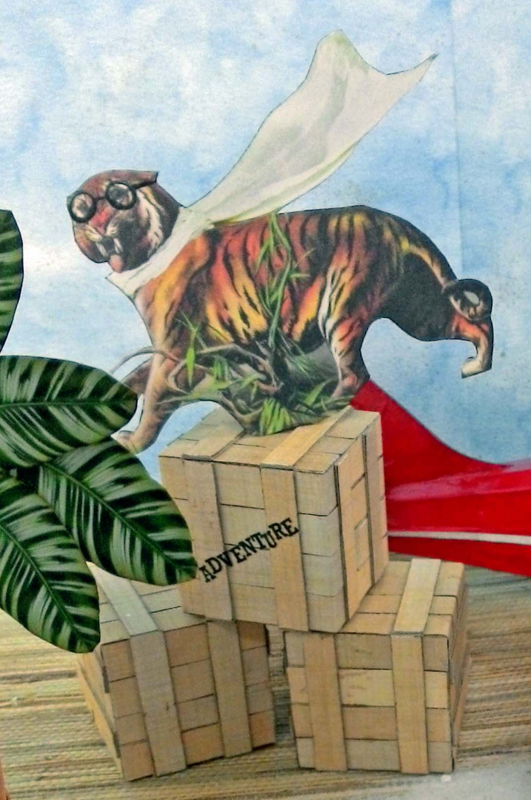 Perhaps you would like to join a group of intrepid explorers armed with only cameras and an adventurous spirit. 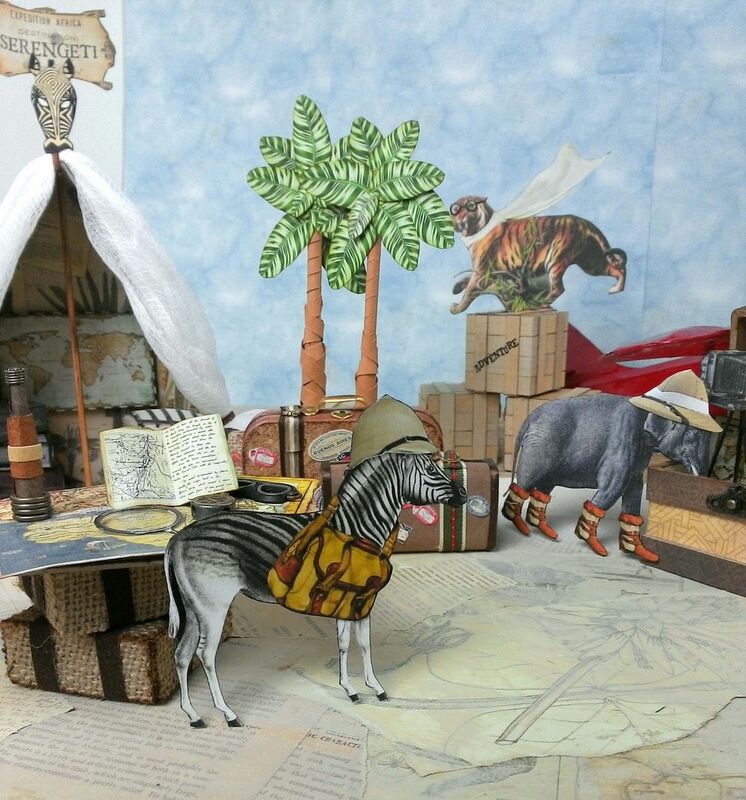 In this scene they are setting up base camp in preparation to delve into the heart of the Dark Continent. Let me introduce you to the group. First, there is Sir Stompington III the expedition leader and his lovely wife Lady Tallia Necker. Monsieur Chromatic is a great asset to the group as he is a biologist and author of book “Primitive Humans and their Habitat”. 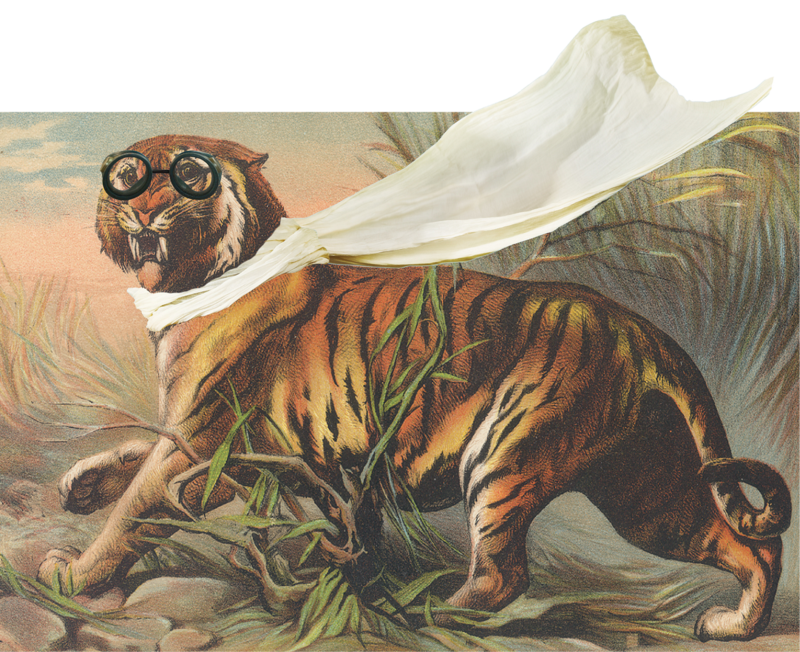 Next, is the world renown adventuress Rita Swiftness. 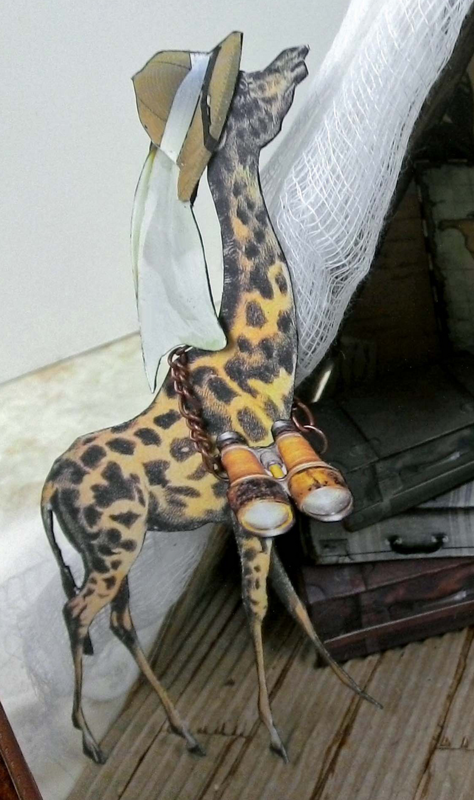 Colonel Rory McPherson is serving as the expedition guide and the dashing Wing Commander (Ret.) Whelan Ofcourse flew to the camp site just this morning from Punjab. All are preparing in anticipation of future discoveries. 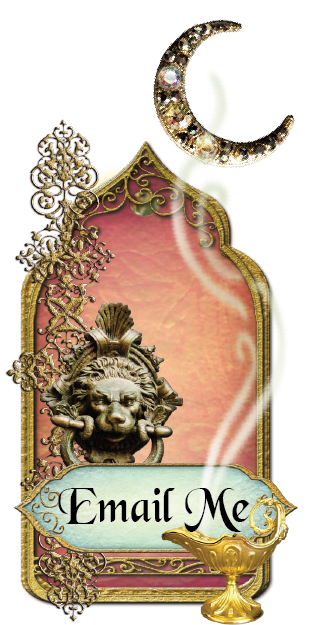 The pentacle of success would be the spotting of the illusive human. 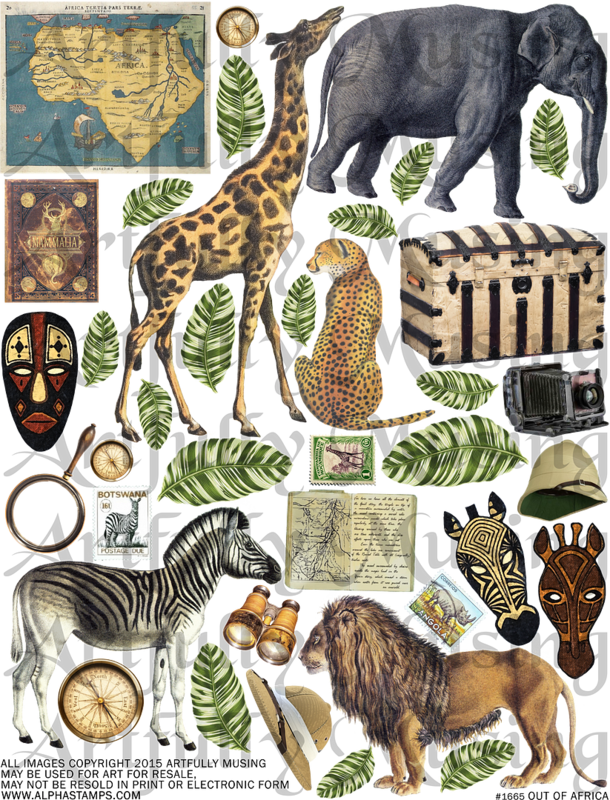 Most of the images you see in the scene are from my new collage sheets and digital image set. 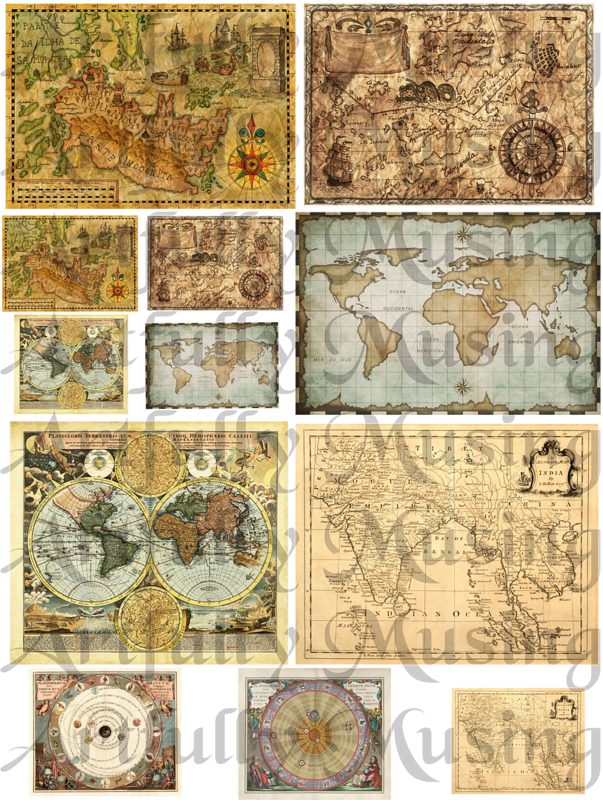 Plus Alpha Stamps has some new travel themed sheets. 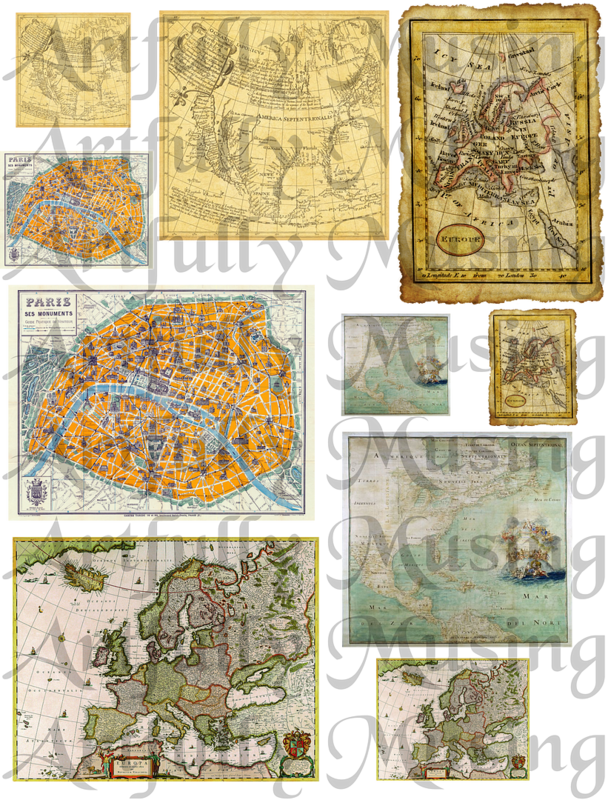 There are a few images that are not part of the new sheets but you will find them at the end of the post so feel free to download them and use them in your art. I’ll walk you through how I made each of the pieces in the scene and I have included the template I used to make the tent. As always at the bottom of the post you’ll find the supply list for all of the products I used. 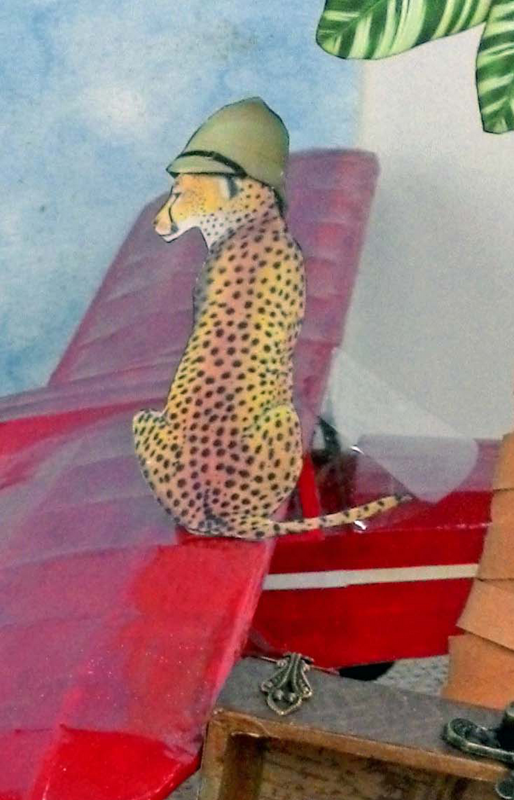 And as a special note, the airplane was not made by me but by my father. I guess that is where I get my love of engineer things. 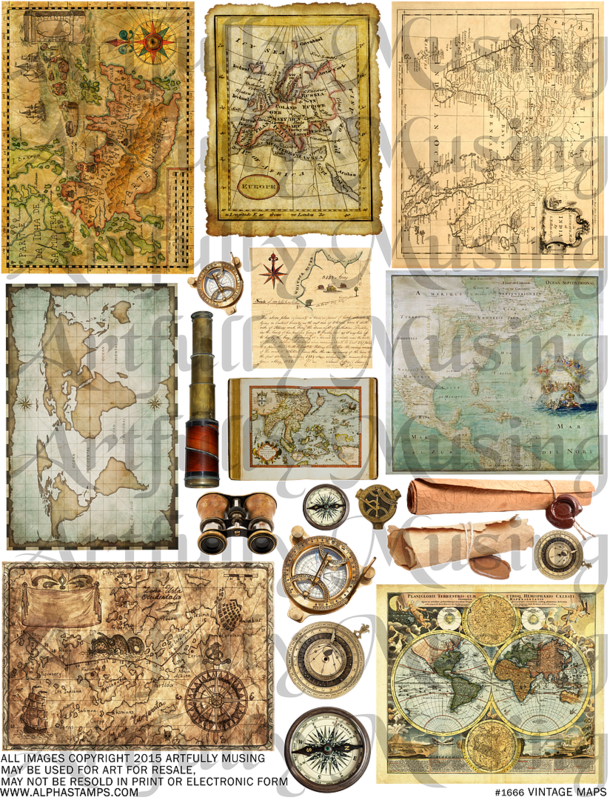 The travel trunk is made from an Alpha Stamps chipboard kit. 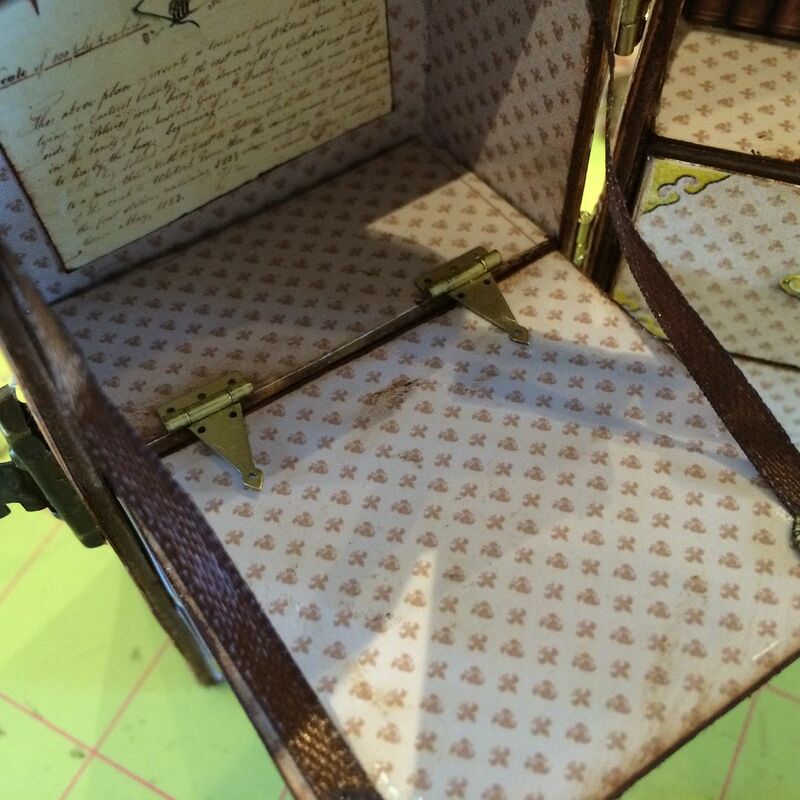 The kit comes with the chipboard to make the trunk, detailed instructions and a collage sheet of drawers for the trunk. 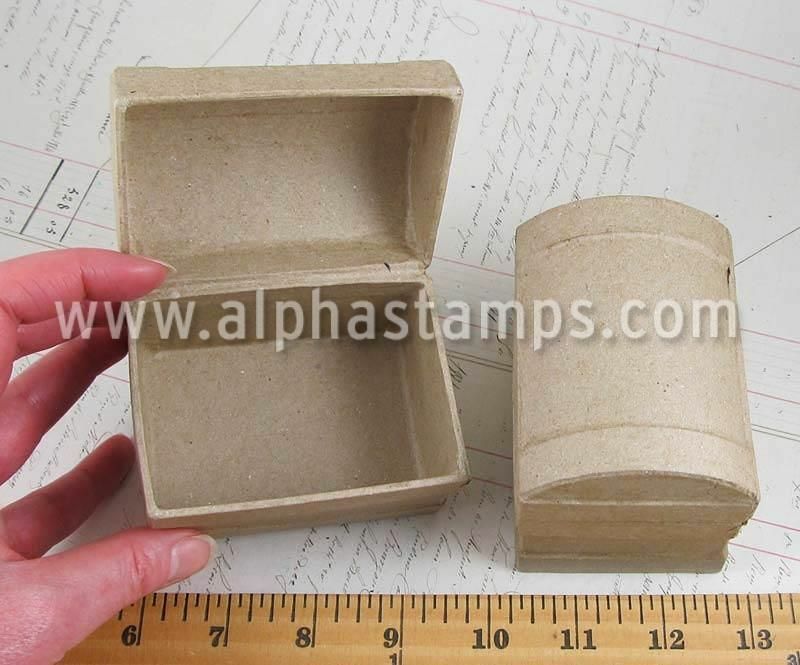 You can also purchase the chipboard separately and the collage sheet of drawers separately. 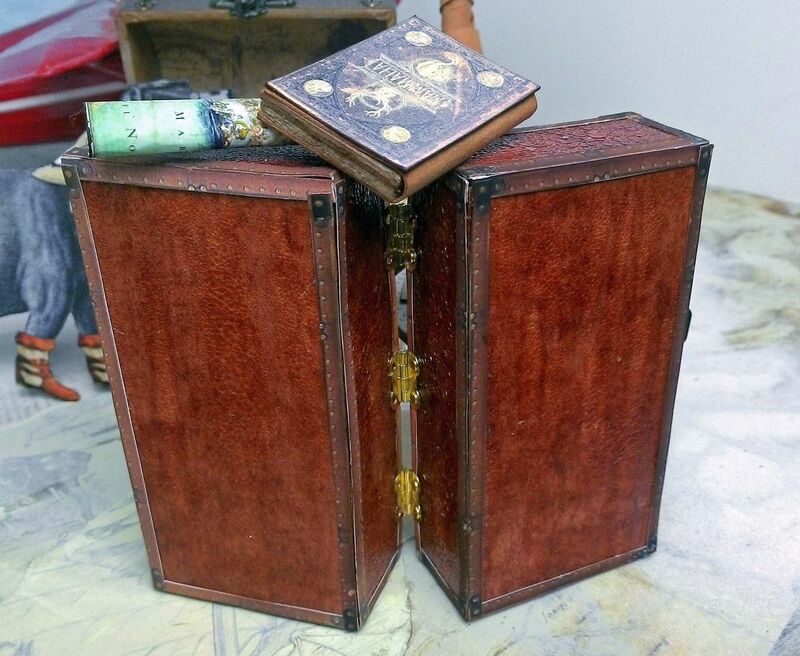 Since there are detailed instructions for assembling the trunk, I’m not going to include those steps in this post but instead, focus on the outside of the chest and the change in configuration I made to the inside of the chest. 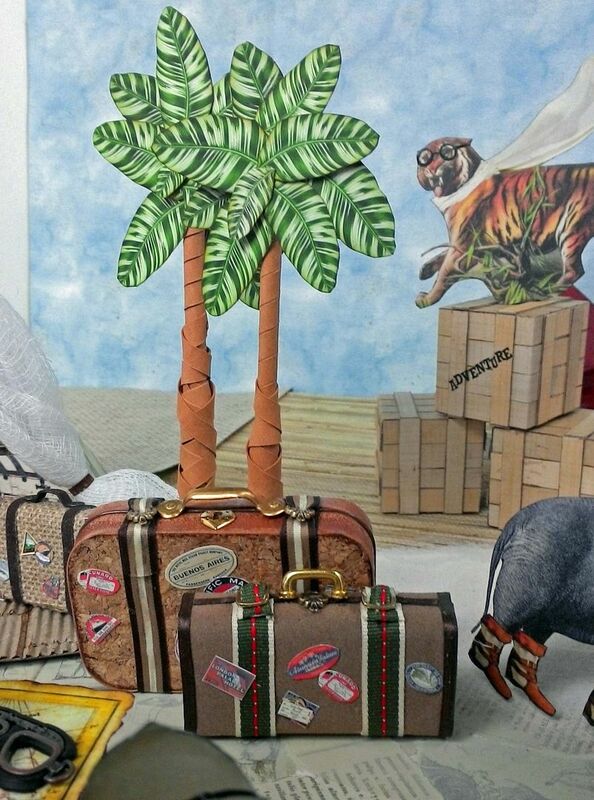 After assembling the trunk I covered the outside with Kraft-Tex Paper Fabric. This stuff is thick and strong but flexible. 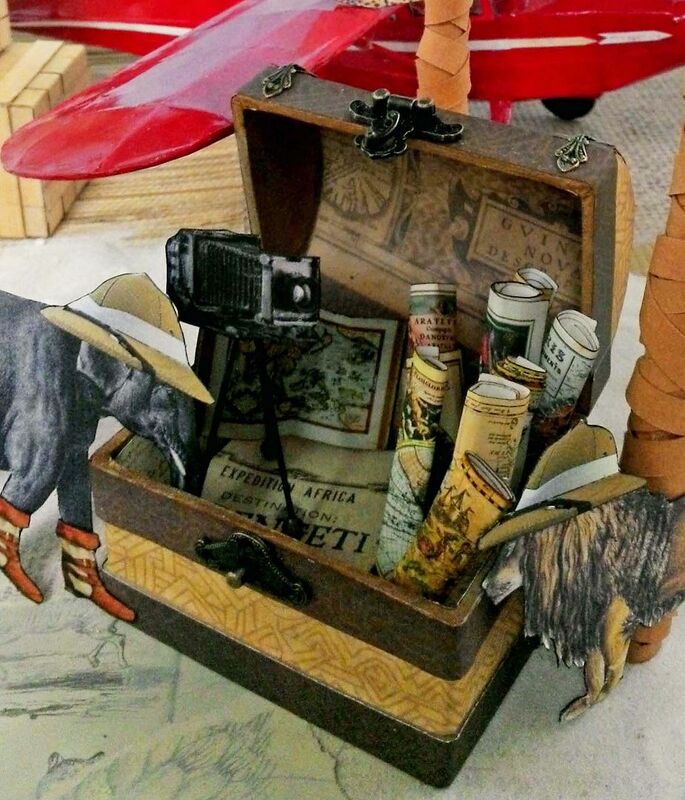 Once I had the trunk covered, I used Vintage Photo Stain on the paper fabric. 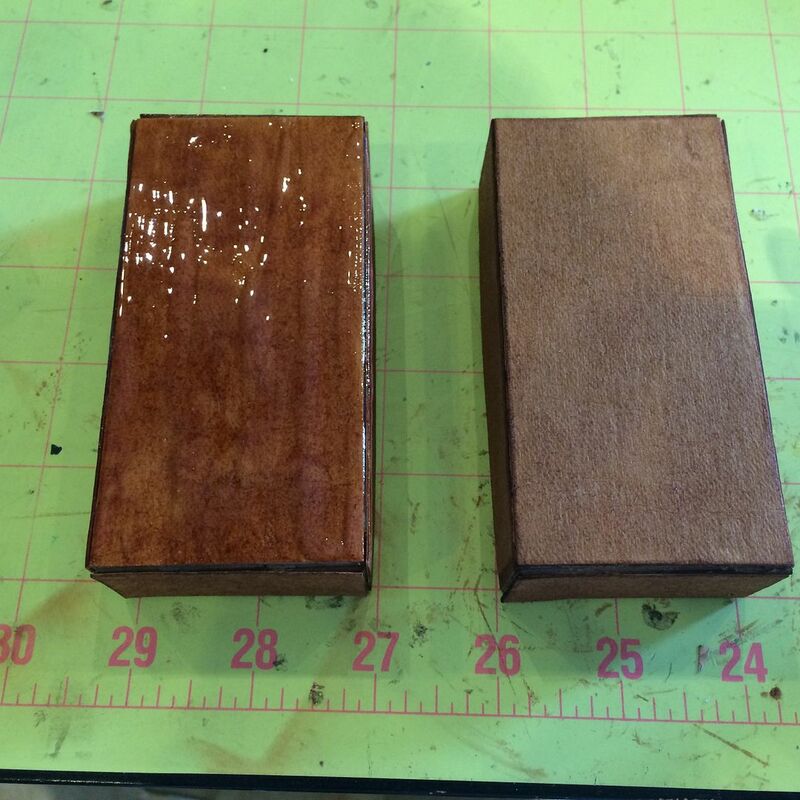 I allowed the stain to dry then I coated the outside with Rock Candy Crackle. 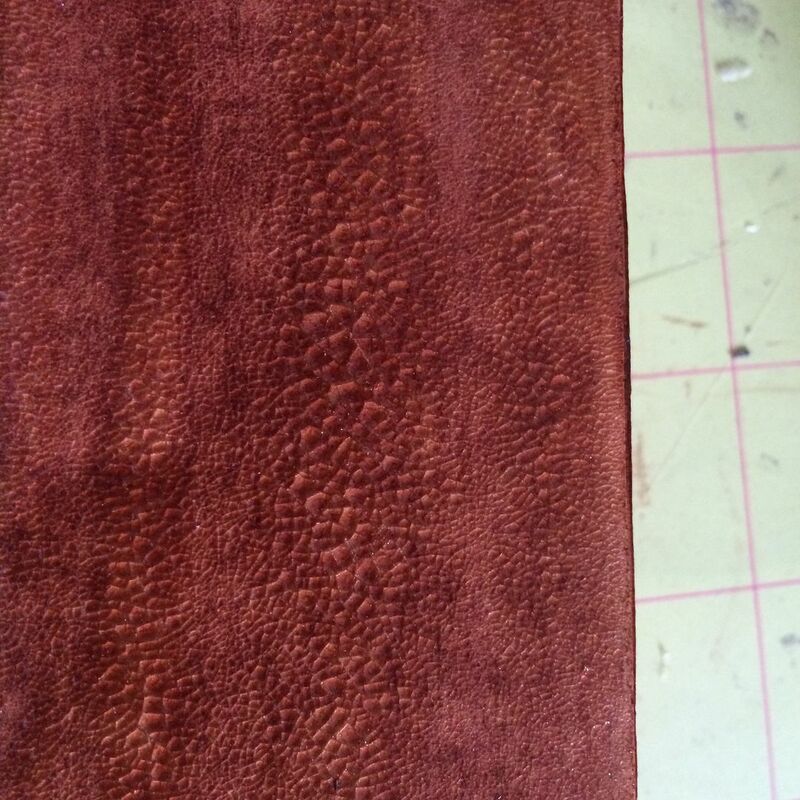 You can see that the crackle made the stain darker, slightly shiny and the paper fabric look like leather or animal skin. For the inside of the trunk, instead of having all drawers on both sides, I left out the top drawers on each side and spaced the bottom two drawers closer together. This left me room at the top of each side. On the left side I cut a piece of chipboard to make a drop down front. 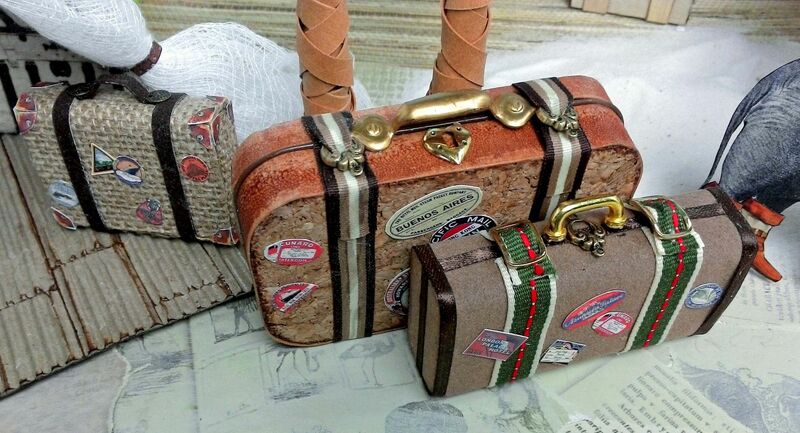 The chipboard is glued to the trunk. I used small hinges to give it the appearance of being hinged. I used ribbons and 7mm Hammered Metal Disks to complete the look. 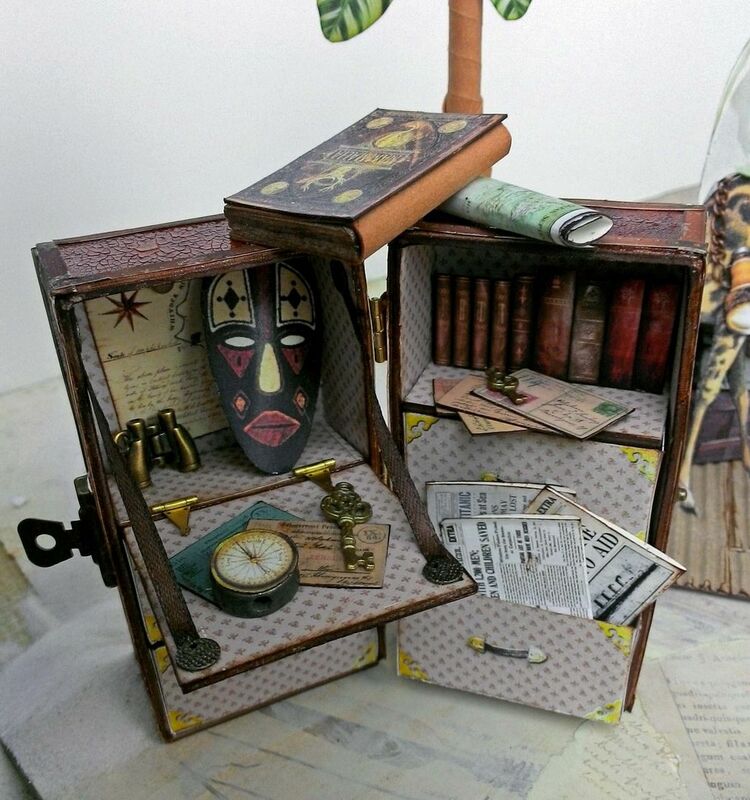 The compass you see on the in the trunk and on the desk is made by using one of the images from the Vintage Maps collage sheet and gluing it to the bottom of a typewriter key. I used the bottom side as the top side is curved. 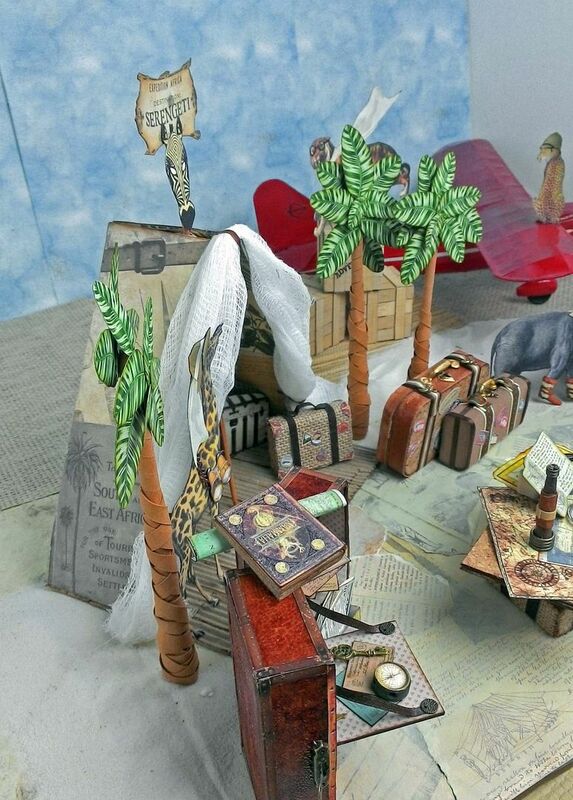 On the right side, I added some books popped up from the back of the trunk and letters. 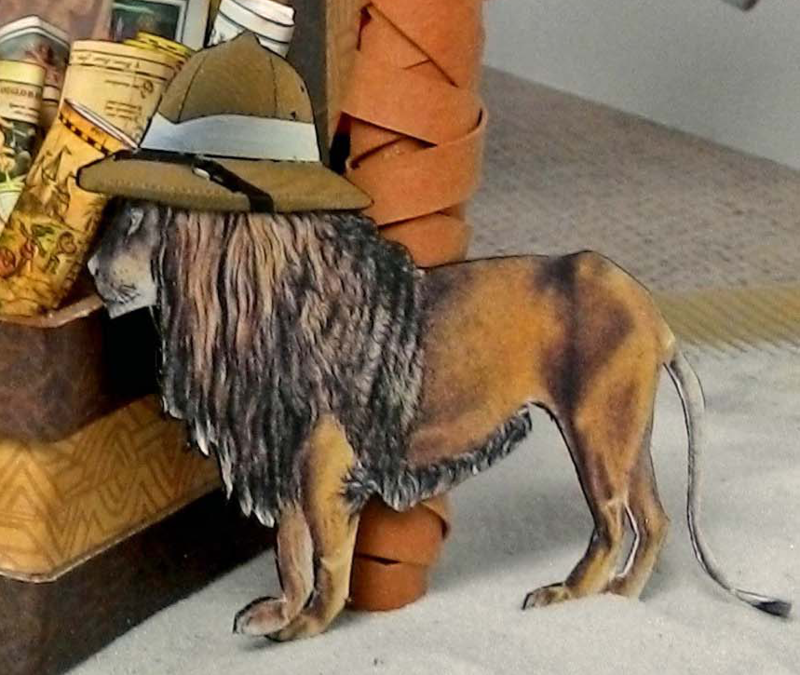 Stuffed in one of the drawers is newspapers. 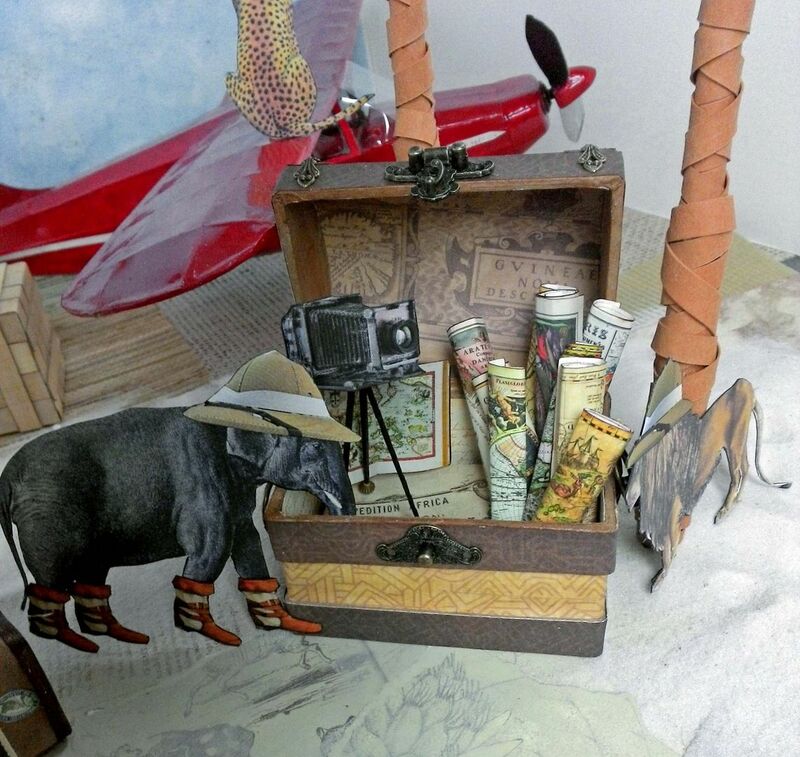 On the left is a set of binoculars, letters and a key. 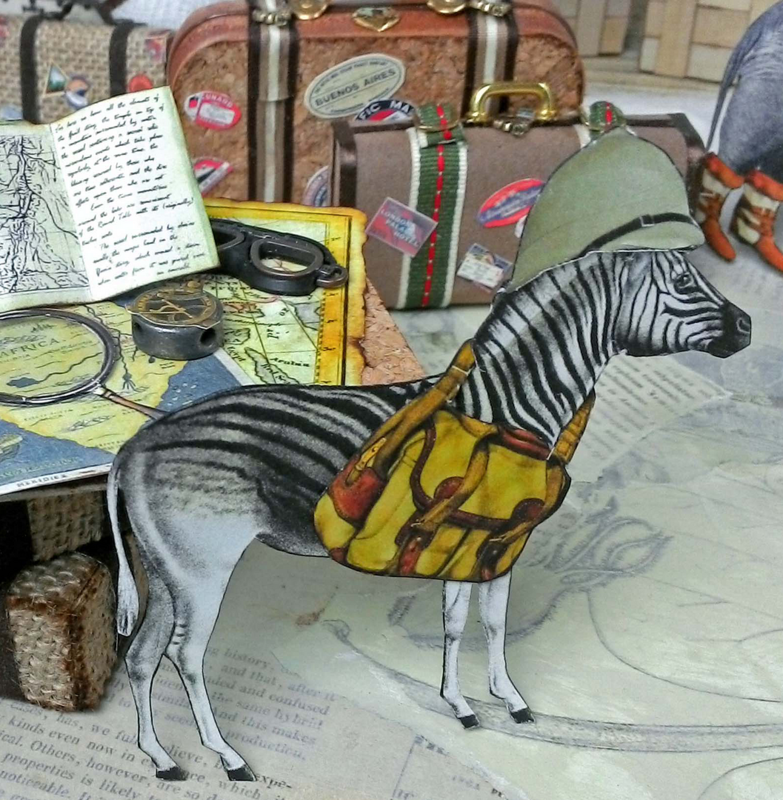 All the trim you see on the trunk is from a new Alpha Stamps Vintage Travel Tags & Hardware collage sheet in which the trims are sized for this trunk and small suitcases. 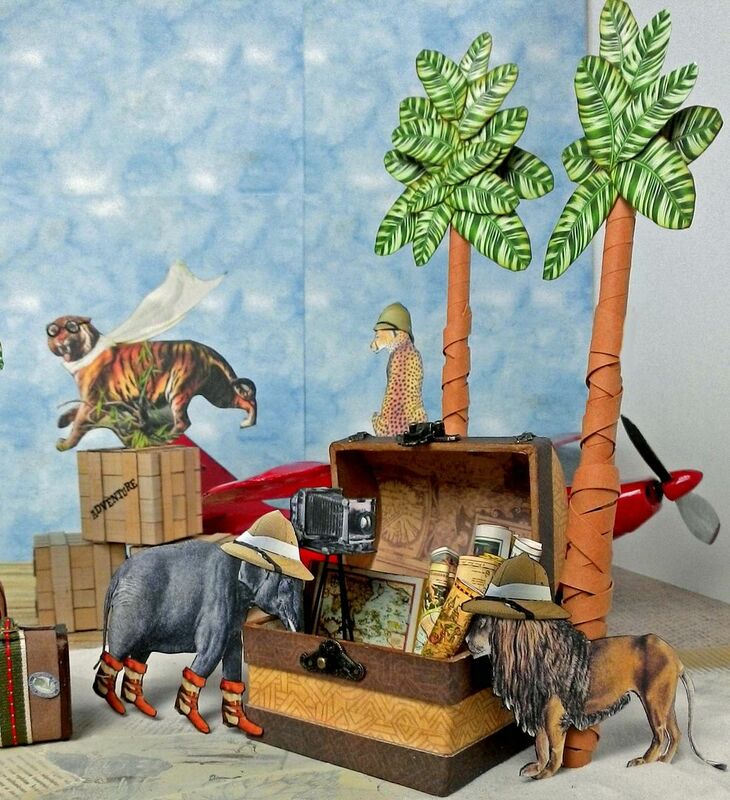 Two of the suitcases are made from Altoids tins. 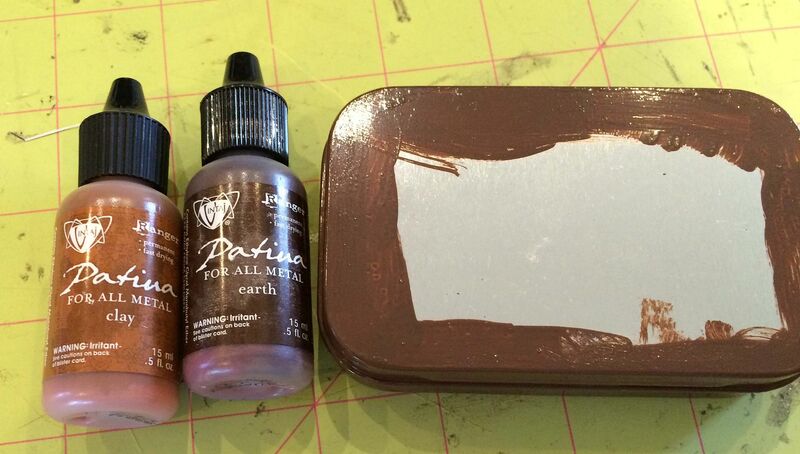 For the larger tin I first started by painting all of the edges with a mixture of Clay & Earth Patina paint. 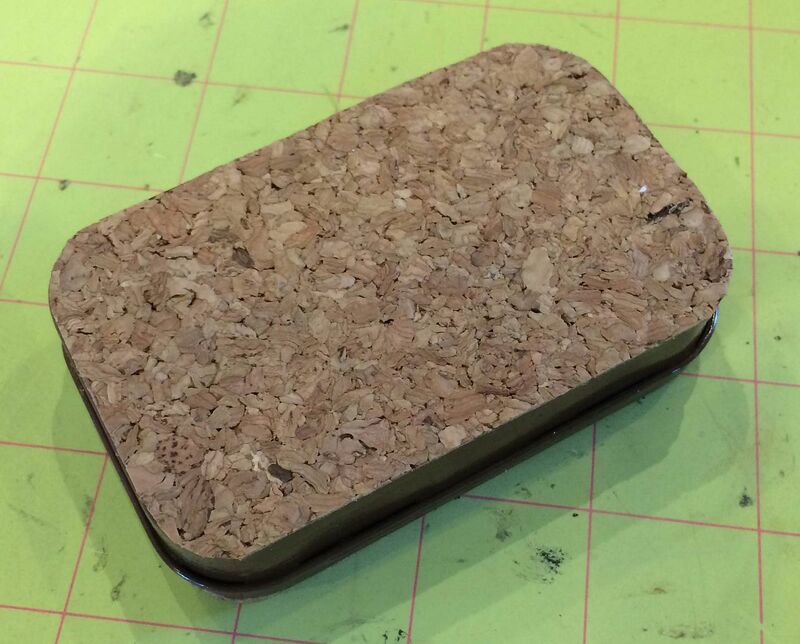 Next, I used a cork sheet from the Tim Holtz Texture Surfaces pack to cover the front and back of the tin. For the sides, I used more of the Kraft-Tex Paper Fabric. This time I crackled the paper first then stained it. 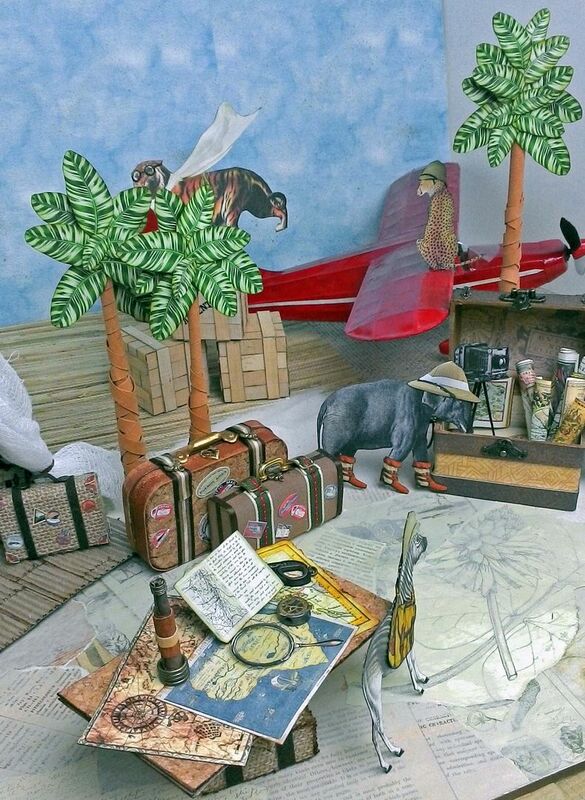 You’ll notice that this caused the paper to be a lighter shade than the paper on the trunk. I trimmed the trunk with ribbon, and other metal bits for the lock and handle. 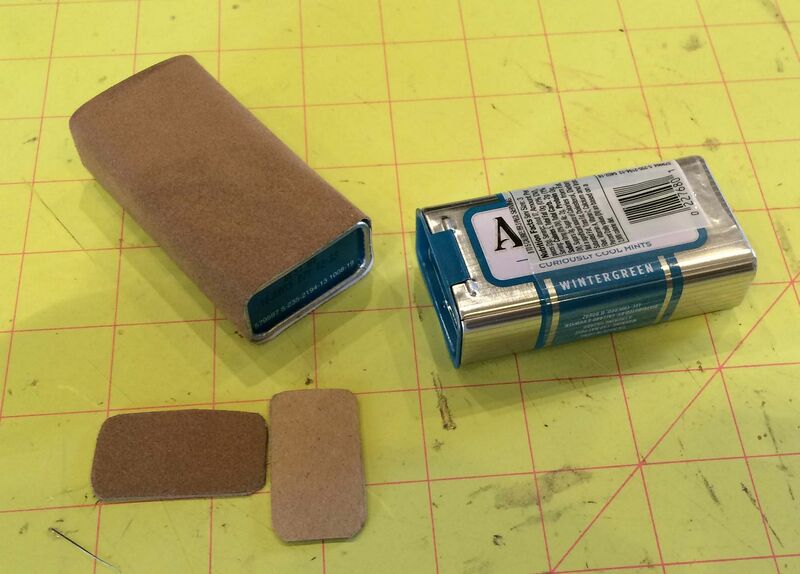 For the smaller tin, I covered the sides with Faux Suede from the sheet pack which contains 6 different colors. 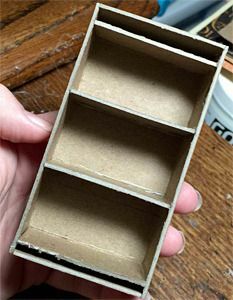 Since the ends of the tin are indented, I cutout and covered pieces of chipboard the size of the ends. I inked the edges and trimmed them with ribbon. 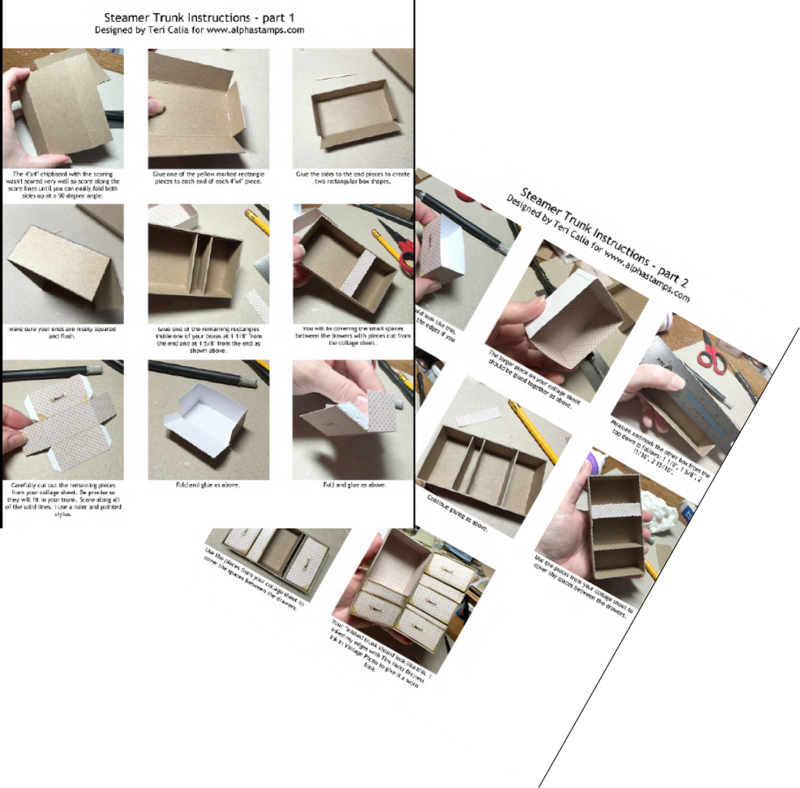 For the matchbox suitcase I used a sheet of burlap from the Tim Holtz Texture Surfaces pack to cover the box and the ends of the drawers. 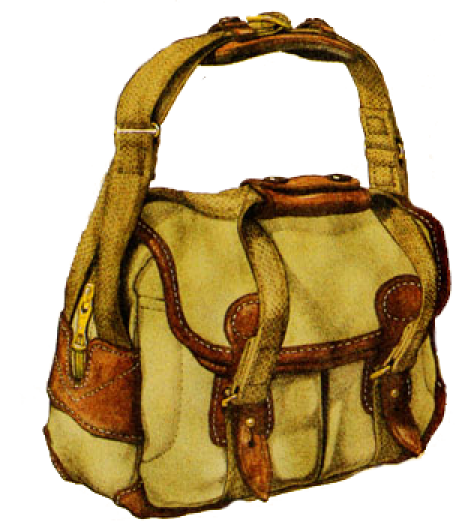 The straps and handle are made from the Faux Suede. 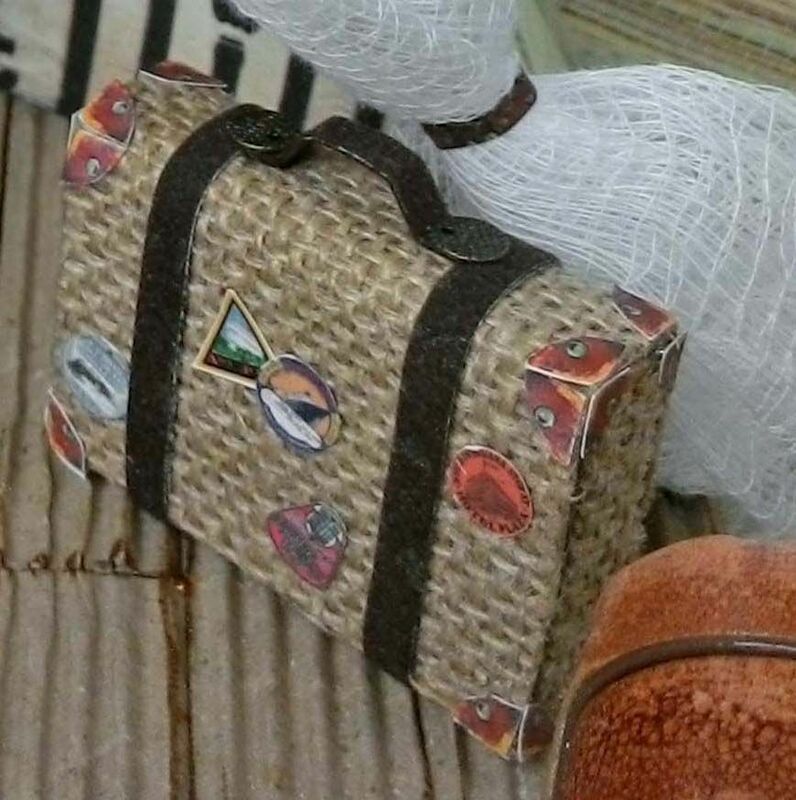 The mini labels on all of the suitcases can be found on the Haunted Ship Travel Collage Sheet and the Vintage Travel Tags & Hardware Collage Sheet. 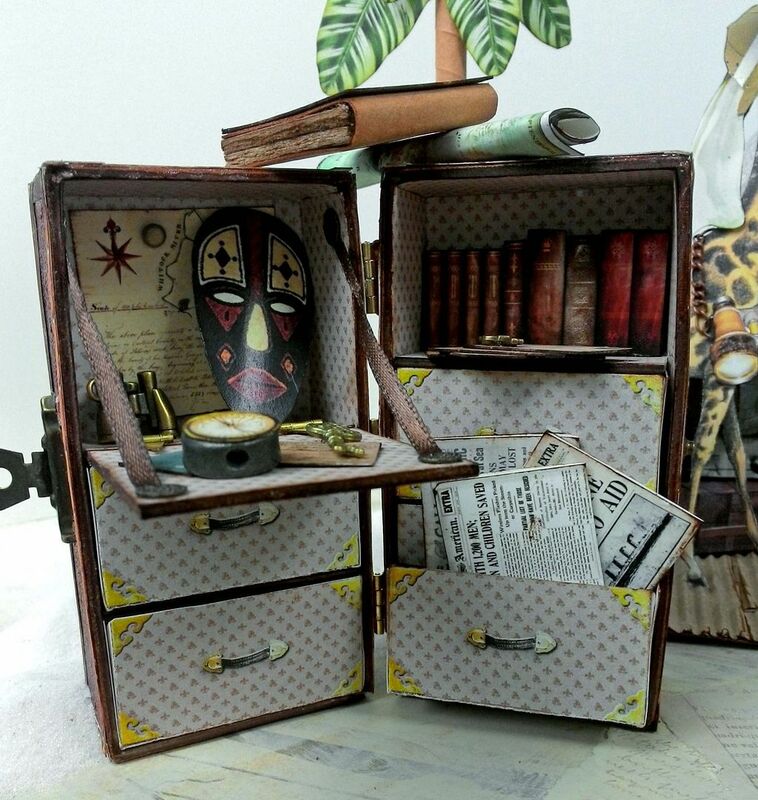 The chest is made from a paper mache chest and covered with paper from the Serengeti Paper Pad. This is the paper I used for the entire project. 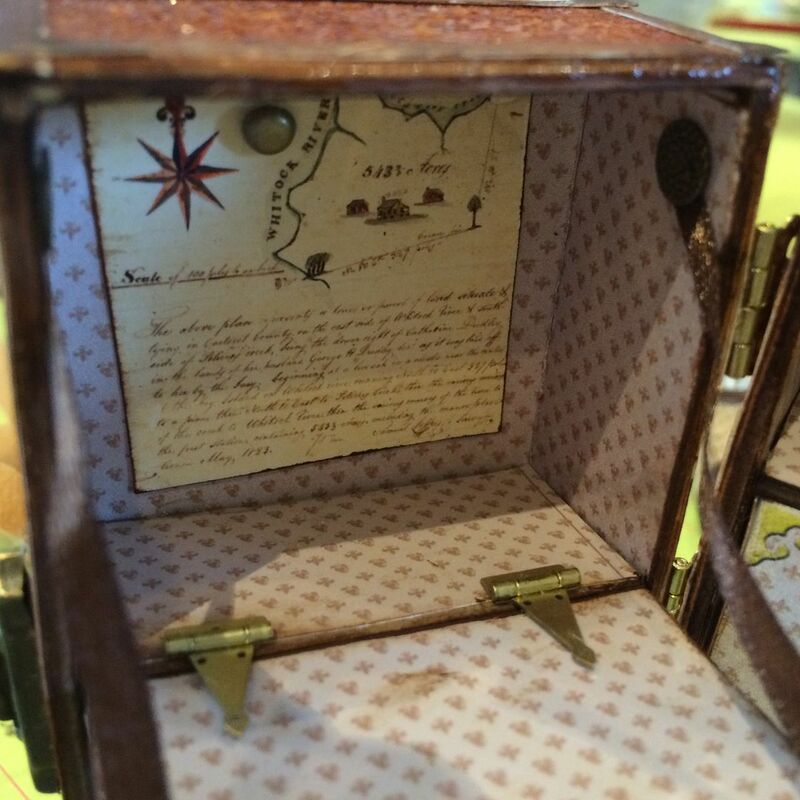 Inside the chest are rolled up maps and a camera on a tripod. 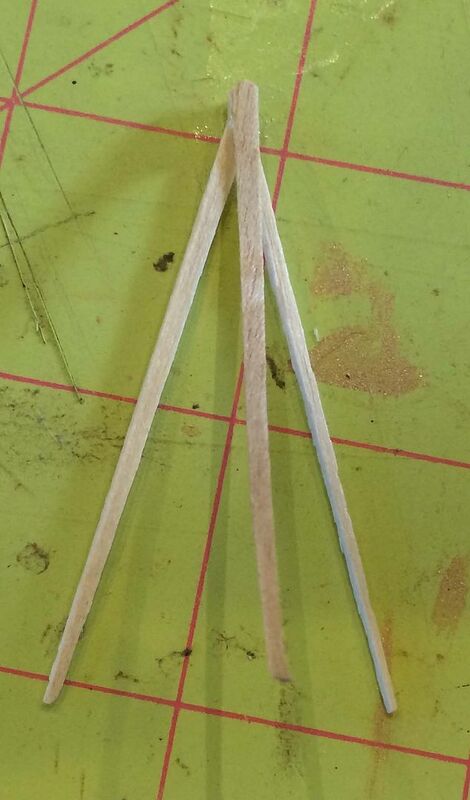 To make the tripod I glued together three flat toothpicks. I stained the toothpicks added the metal beads and the camera. The table is made from a piece of chipboard covered with cork. The base is made with pieces of wood from my stash covered with burlap and trimmed in Faux Suede. The spy glass on the table is made by rolling a scrap piece of paper into a cone shape. 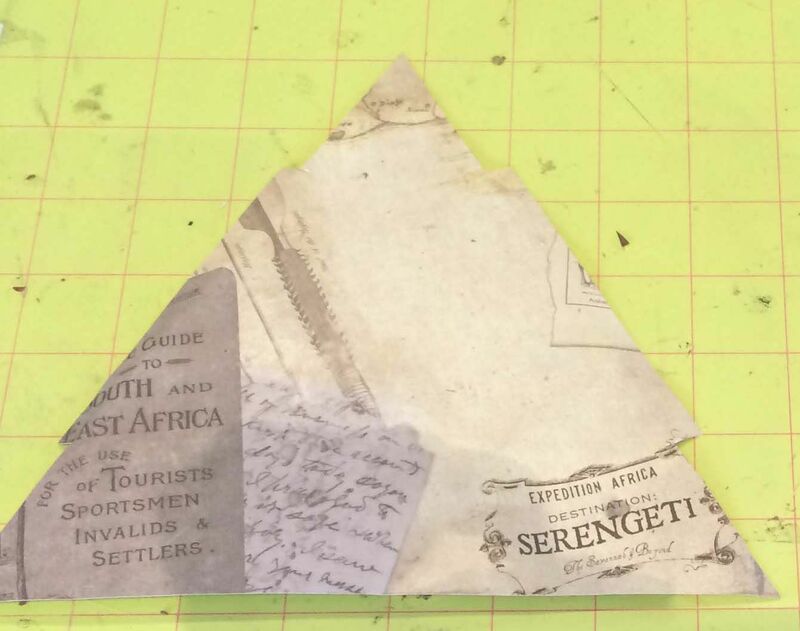 I glued the paper in place and cut away the excess. I slid different sized jump rings on each end and marked where to cut the paper. 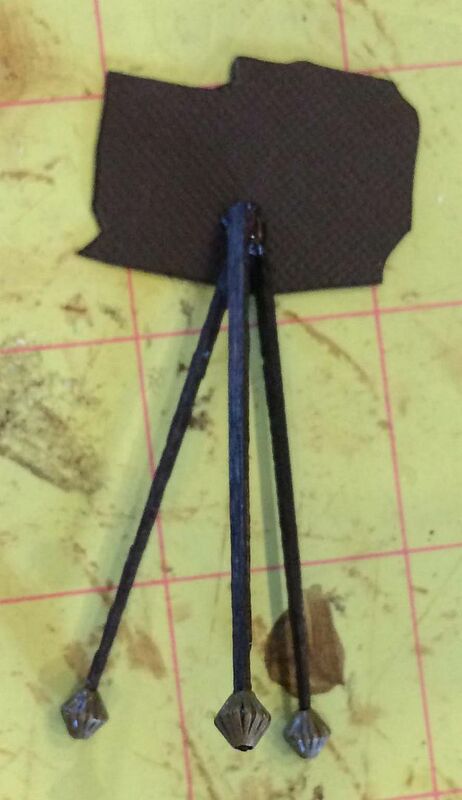 After cutting the paper away, I glued the jump rings onto the cone. I trimmed the spy glass with Kraft-Tex fabric paper and Faux Suede. 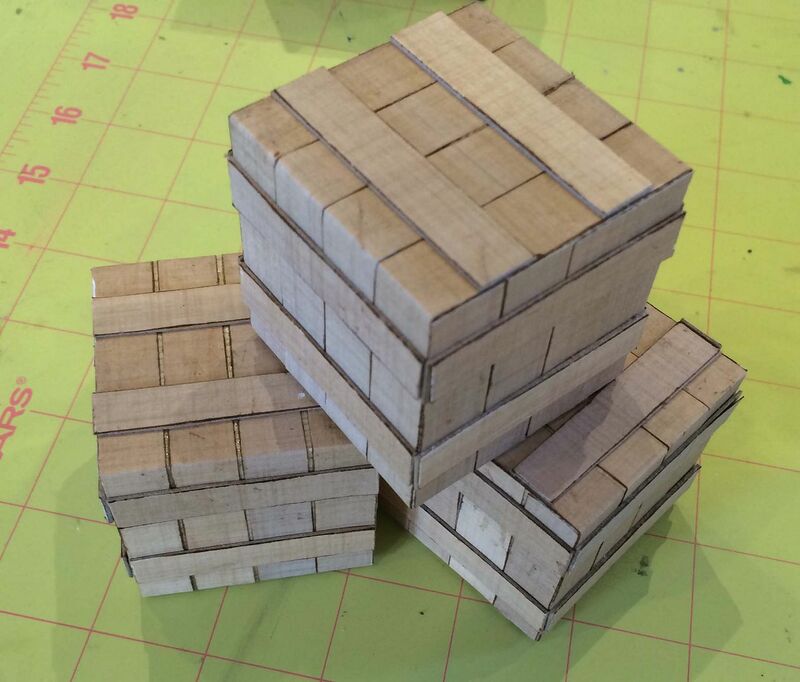 The crates are made from 2” blocks of wood. I cut long strips of paper and inked the edges so that each strip would stand out and look like planks of wood. 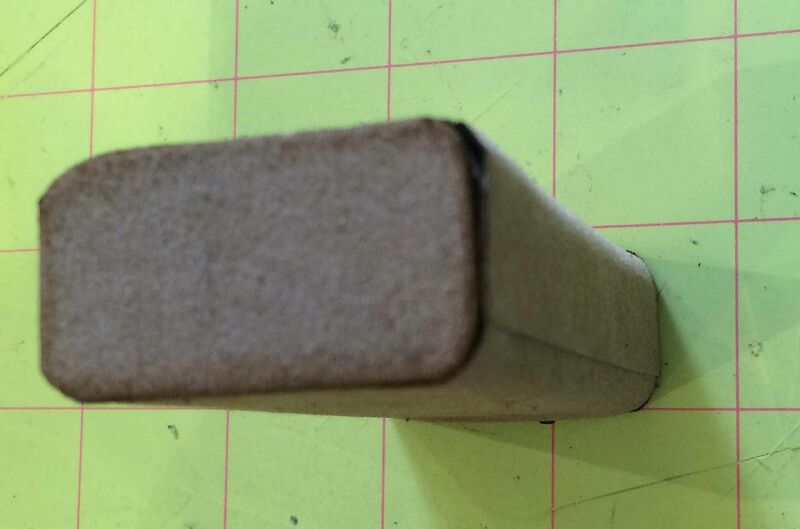 I wrapped the wood with the paper, starting from the edges which helped keep the edges straight. 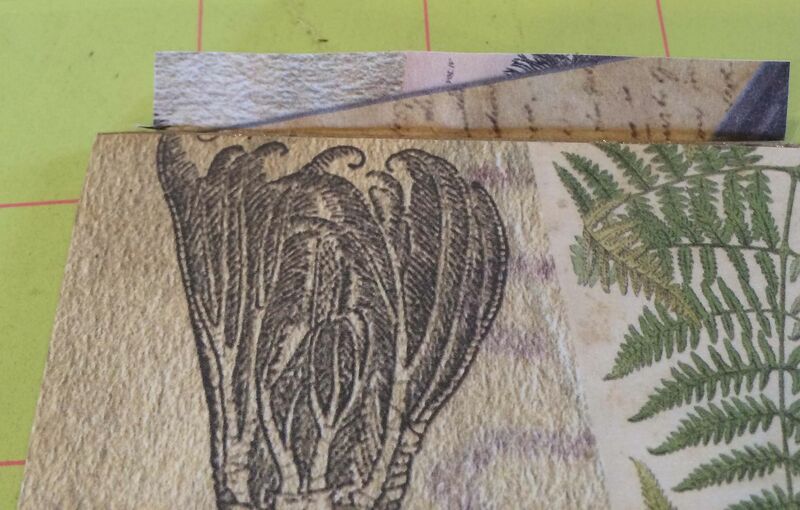 I cut short strips of paper slightly narrower than the long strips and 2” long. 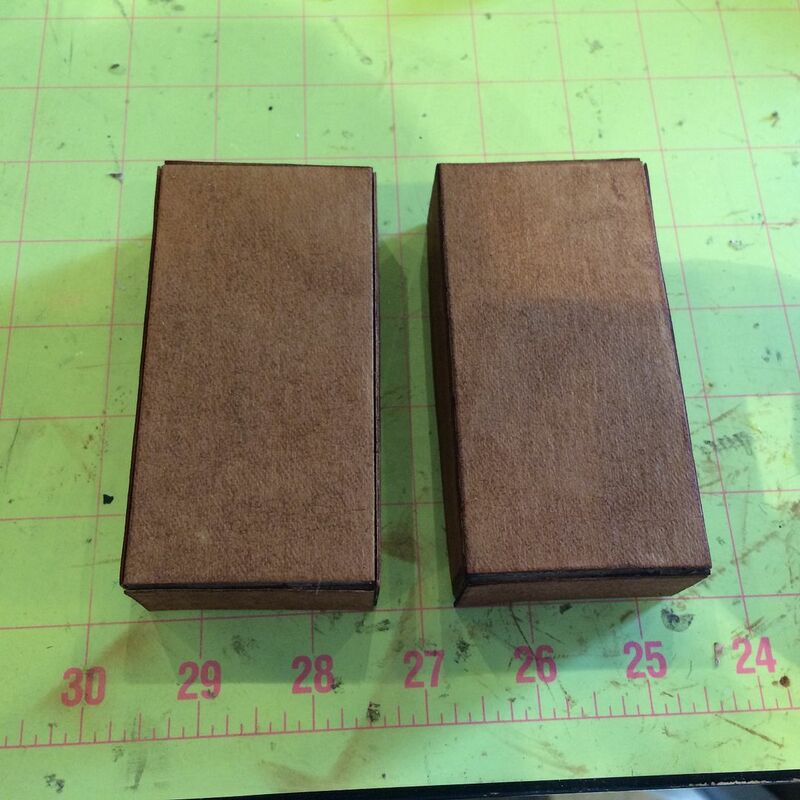 I glued them to chipboard, inked the edges and then attached them to each side of the blocks. 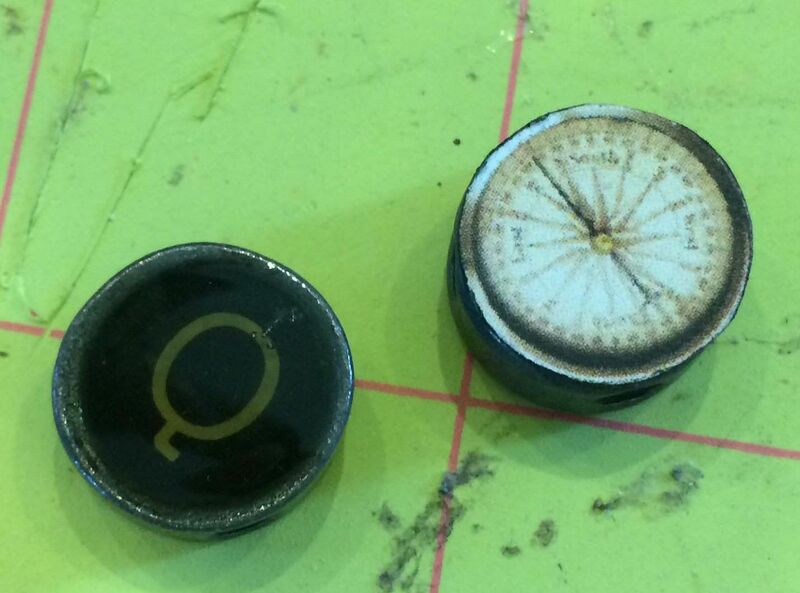 This made pieces looked raised. 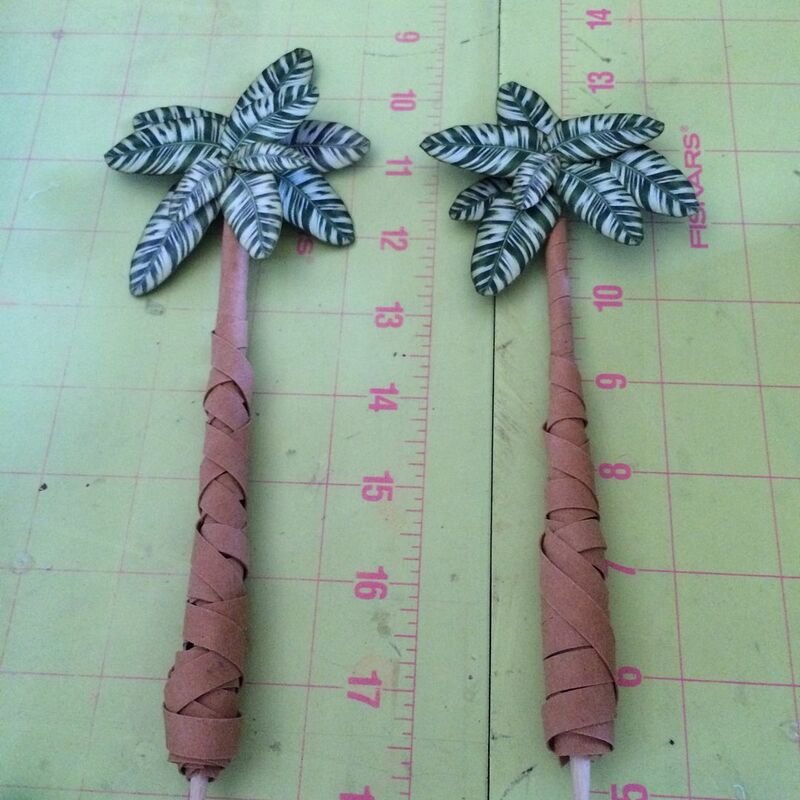 The trees are made by wrapping wooden dowels with the Kraft-Tex Fabric Paper. 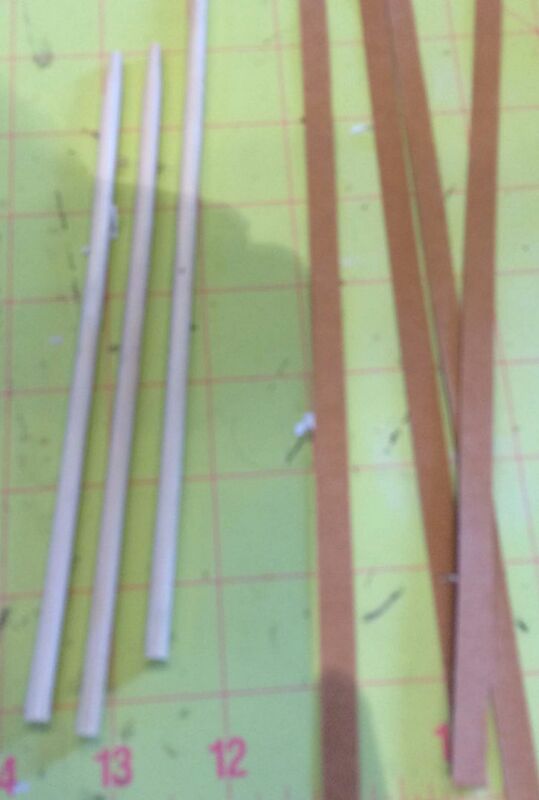 I cut the paper into strips and then started wrapping the dowels and gluing the paper in place. For the first wrap, I covered the entire dowel by wrapping the paper against each edge of the paper. 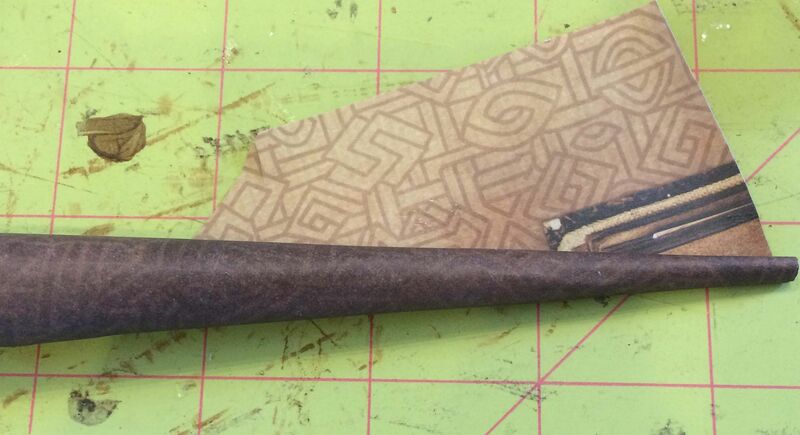 For the next wrap, I left gaps between the edges of the paper and wrapped it the opposite direction of the first wrap. Also notice that I didn’t go all the way to the top with the second wrap. For the third wrap I again left gaps and wrapped in a different direction than the second wrap. I continued with more wrapping until I felt like the trunk was thick enough. The point with not going all the way to the top with subsequent wrappings is to make the trunk thicker at the bottom than at the top. With each wrapping I stopped lower and lower on the trunk. 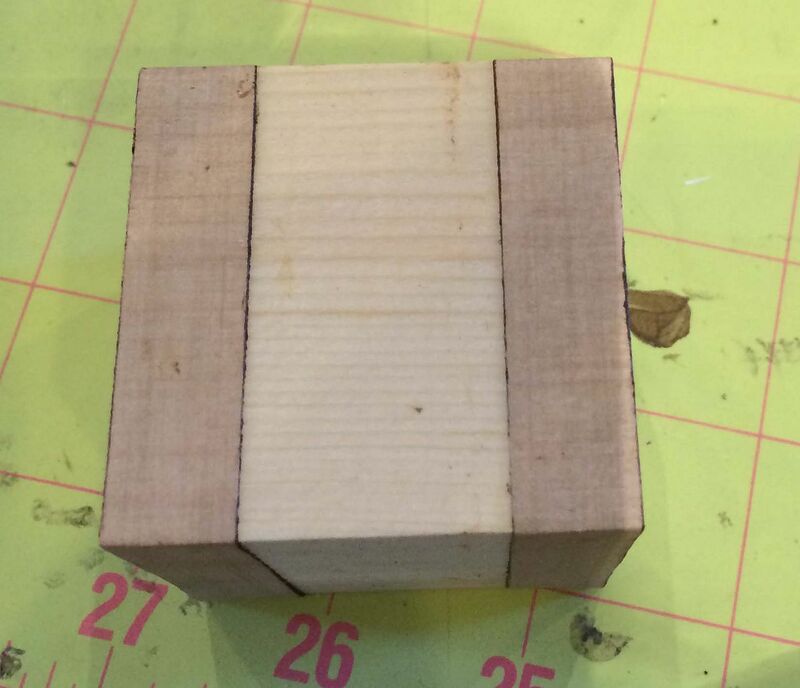 The point of wrapping in opposite directions is to make it look more like a real trunk. Don’t worry about wrapping the paper perfectly as trunks don’t grow perfectly. The Kraft-Tex Paper really worked great for the trees as it is thick and pliable. If you were to do this with regular paper it would take a long time to wrap the trees so that the trunk was thick enough. I left part of the bottom of the tree exposed which will be inserted into and glued to the foam core base. 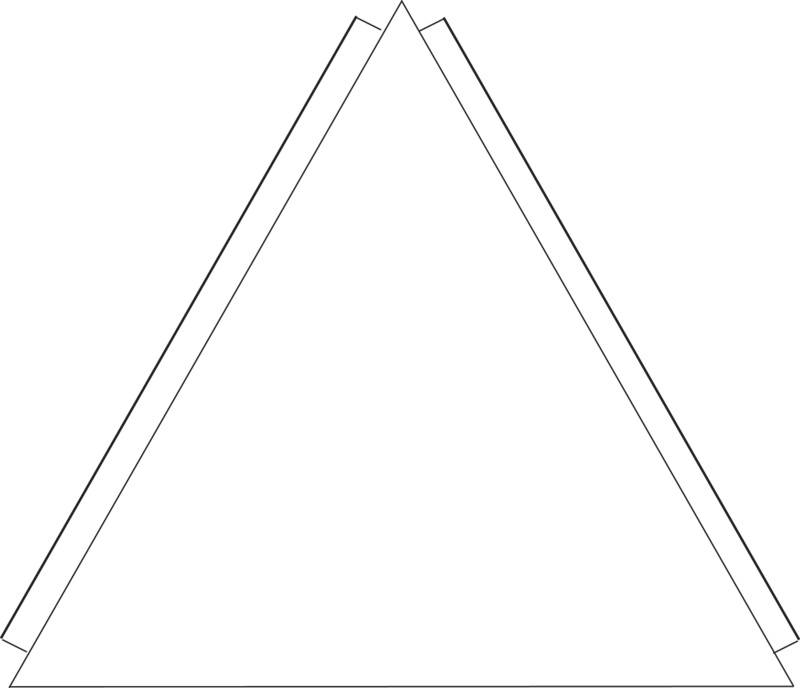 I made a template to construct a simple tent which consists of a back and two sides. 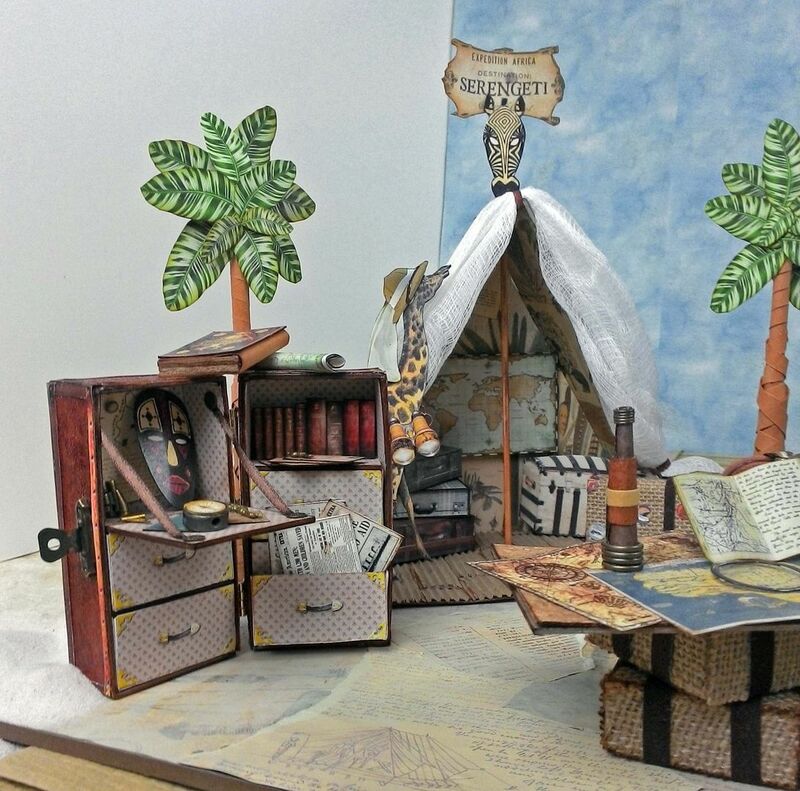 Both of the side pieces and back pieces consist of a piece of decorative paper, a piece of chipboard and another piece of decorative paper. 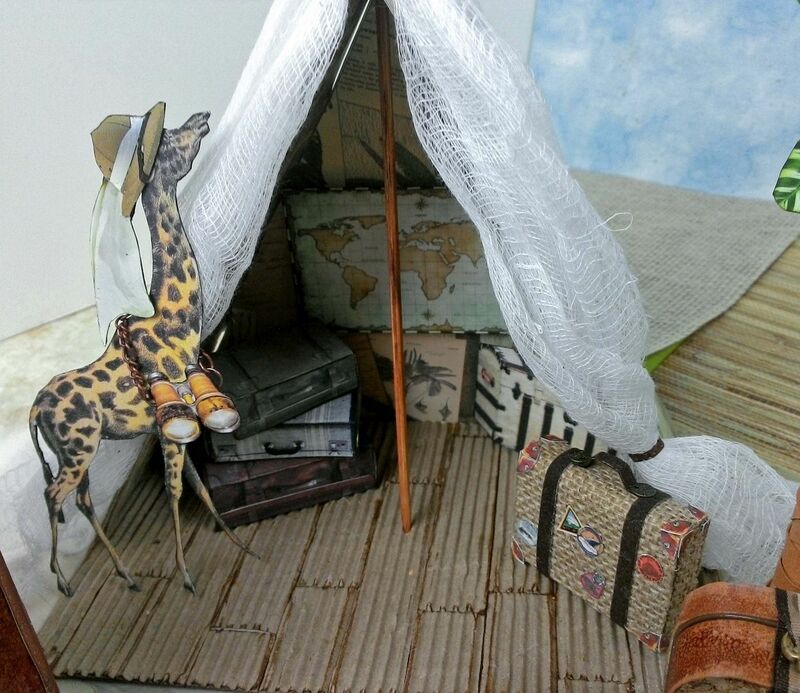 Sandwiching the chipboard between the decorative paper made the tent sturdy. 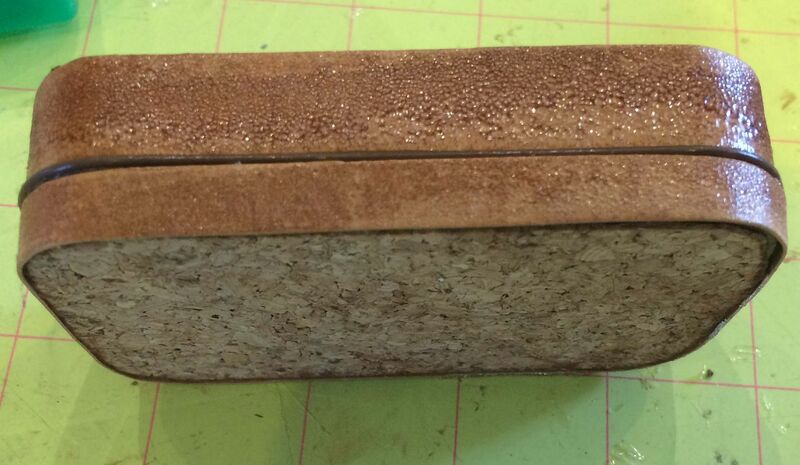 Don’t cover the tabs with chipboard as it will make them hard to bend. 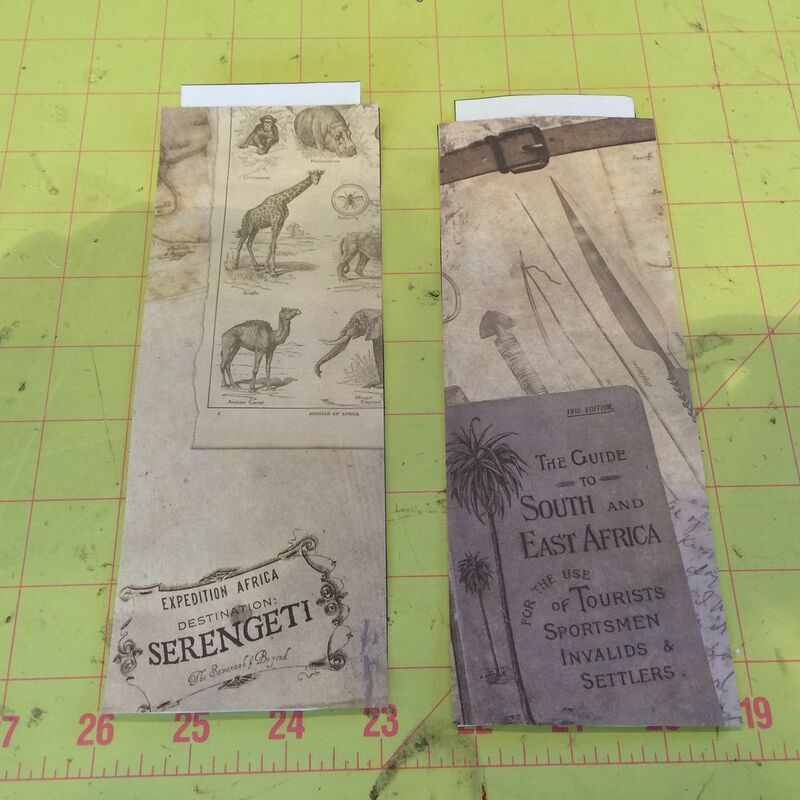 I did cover the tabs with the decorative paper (on one side) so that there would not be a white line when pieces were glued together. Feel free to use the template below. 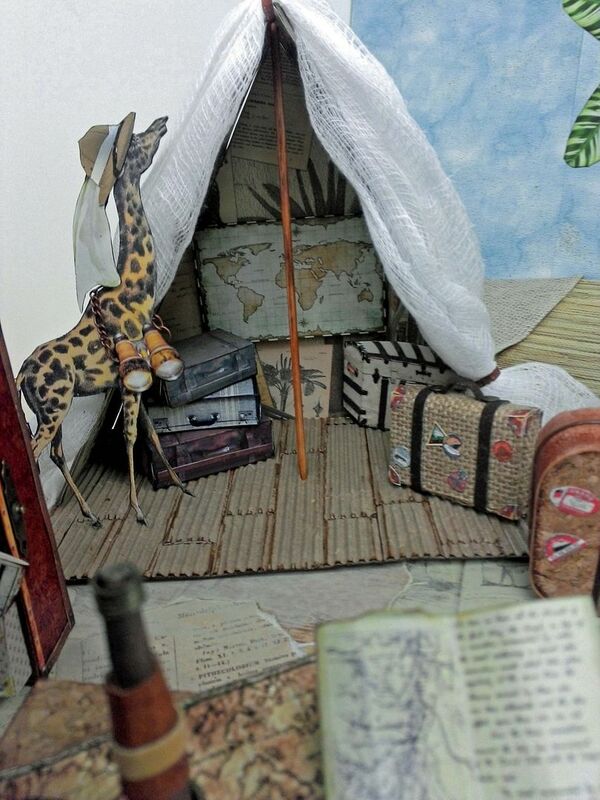 A wooden skewer goes from the top of the tent through the floor and the foam core base of the scene. This helps keep the tent in place. At the front of the tent I draped cheese cloth. 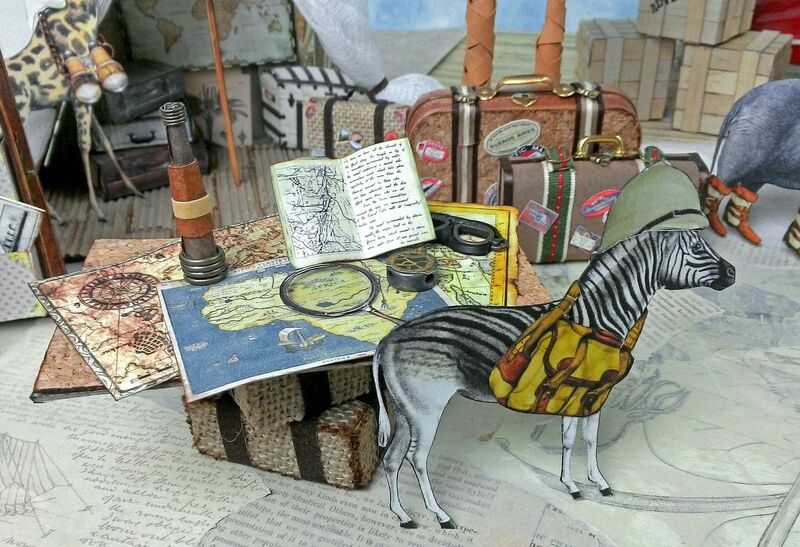 Inside the tent is a map and faux suitcases. 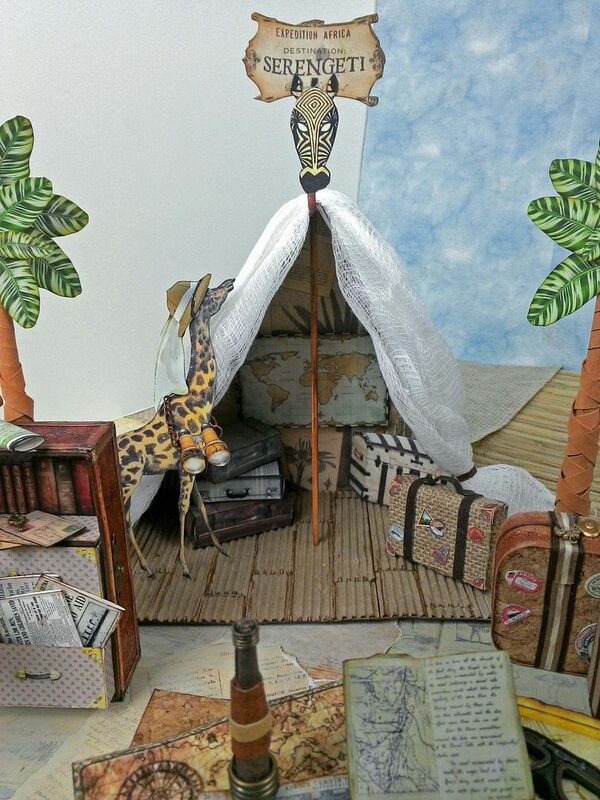 The floor of the tent is made from strips of corrugated cardboard cut into strips, inked and glued on a piece of cardstock. 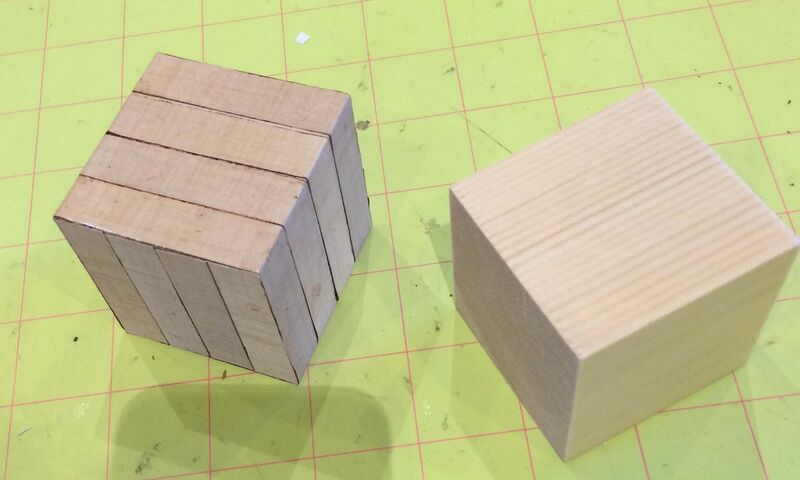 I cut the strips into two different lengths and then staggered the lengths as I glued them in place. 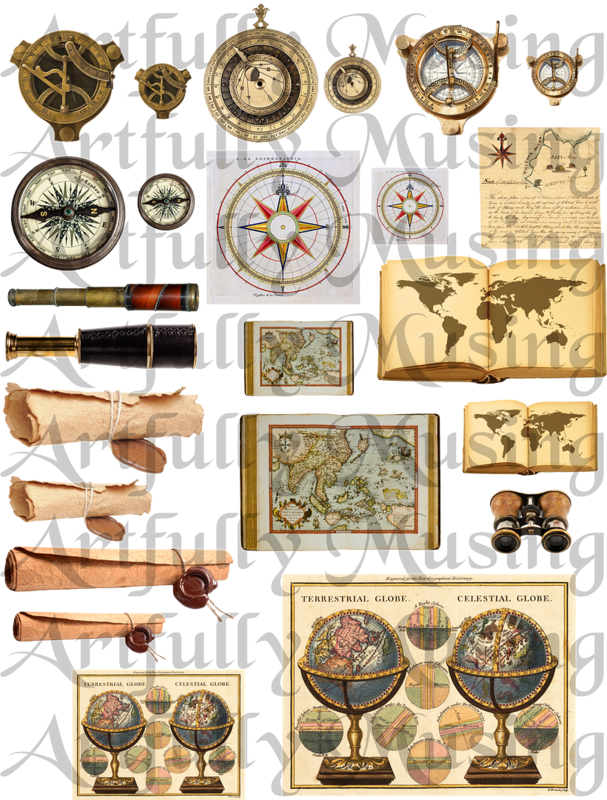 Some of the images I used are not on the collage sheets, but I have them for you below, so feel free to use them in your art. 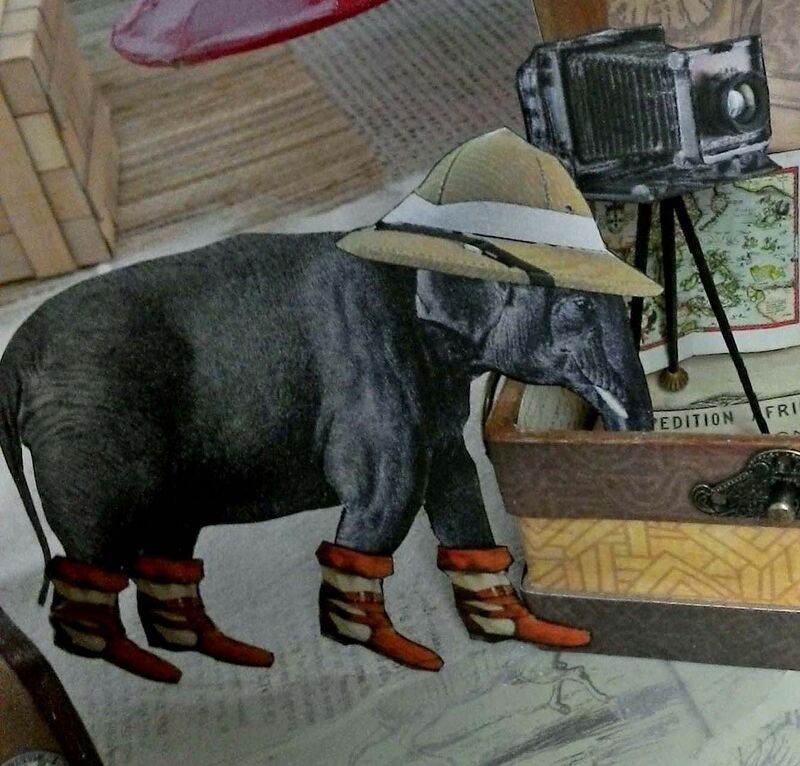 The shoes and satchel are sized for elephant and the animals on the collage sheet.